We always transform for betterment. We love to behold the beauty of transformation it went through. Success requires tremendous amount of positive energy just like transformation of a butterfly. Loads of hope! Transformation is both deep and vast. After every dark night, there is a beautiful bright day. It means 'growth' after all. We are just like them! We too can reach our great destinies by changing what needs to be changed. Growth is essential for life. 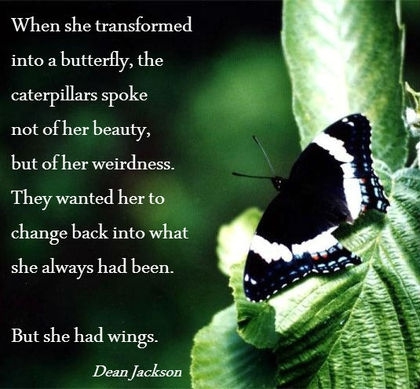 One of the sweetest butterfly transformation quotes! Look what wonderful words a butterfly has to tell us. The beginning of something - the end of something. So never give up. 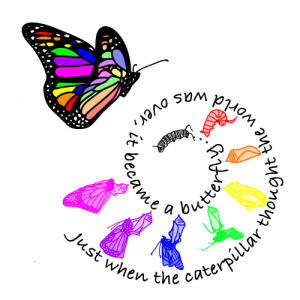 Just keep going on and you might turn out to be a butterfly someday. Transformation is permanent. You're just a different person after that. We should appreciate the truth behind their beauty too. Server responsed at: 04/23/2019 8:20 p.m.